The schools taking part in Loving Laughing 2019 are Croft Church of England Primary School, Waltham on the Wolds CE Primary School, St John Fisher Catholic Voluntary Academy, Mayflower Primary School & Holy Cross Catholic Primary School. Professional comedians have been visiting the schools mentoring and training the young people in joke telling. The young people will write their own jokes on subjects they select and take part in the finale, telling their jokes to a selected audience of children, school staff and family members. Leicester Comedy Festival has a long tradition of working with partner organisations to encourage wide participation in the annual event. Previous projects include workshops using improvised comedy and cartooning to develop young people’s confidence and language skills. In 2019 Loving Laughing is taking place as part of The UK Kids’ Comedy Festival, alongside the Laugh Term Comedy School which is a project designed to teach teenagers how to become stand up comedians. The Loving Laughing project, and The UK Kids’ Comedy Festival, are supported by East Midlands Airport, Tui, Red Monkey and Leicester City Council. The festival is produced by Big Difference Company in partnership with Curve, Spark for Arts and The Mighty Creatives. 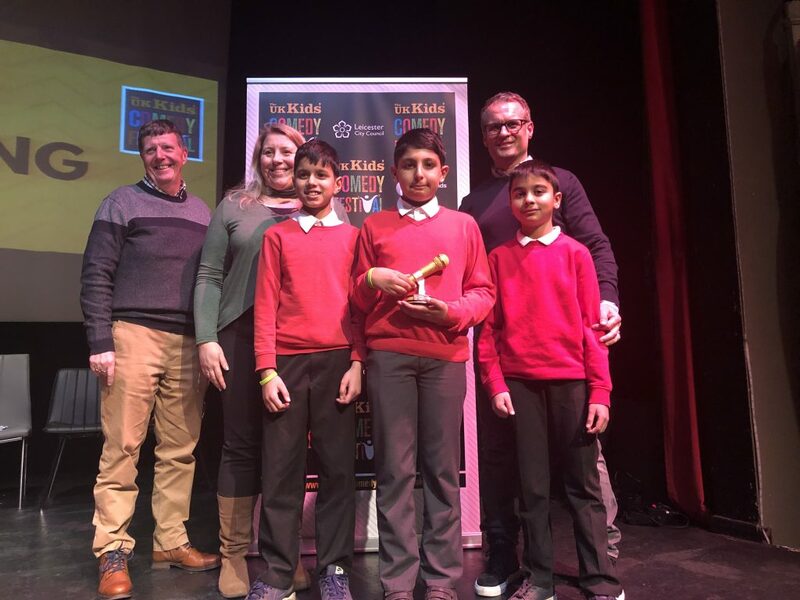 It was the big Loving Laughing finale at the end of the week when one school was crowned the “funniest school in Leicestershire.” Our own Richard Tate was one of the judges at the competition and here he is presenting the award to the winners: Wasim, Umar and Dylan from Mayflower Primary School for their “Posh Restaurant” sketch. Red Monkey’s sponsorship helps children cross the line!